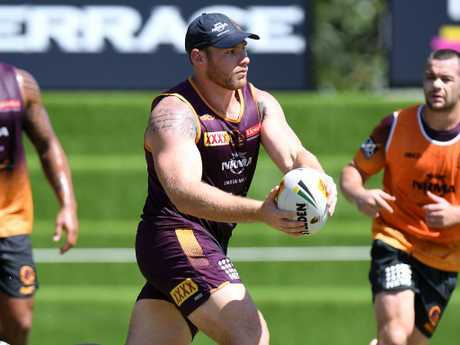 THE Cowboys have dismissed suggestions that the young Broncos forwards could be vulnerable in Friday's derby blockbuster in Brisbane following prop Matt Lodge's shoulder charge ban. Cowboys coach Paul Green has stuck with the winning formula from their opening round win over the Dragons, with prop Corey Jensen added to the 21-man squad in the only change. But the Broncos have been forced to reshuffle their pack without Lodge as Tevita Pangai Junior moves to starting prop with former Cowboy Shaun Fensom coming on to the bench. The Broncos boast some of the most exciting young forwards in the NRL, but they were outplayed in last weekend's season opener as the Storm claimed a clinical 22-12 victory in Melbourne. Meanwhile, North Queensland's pack ran rampant in their 24-12 win over Dragons as Jason Taumalolo made a career-high 301m while former Bronco Josh McGuire (170m) also starred. 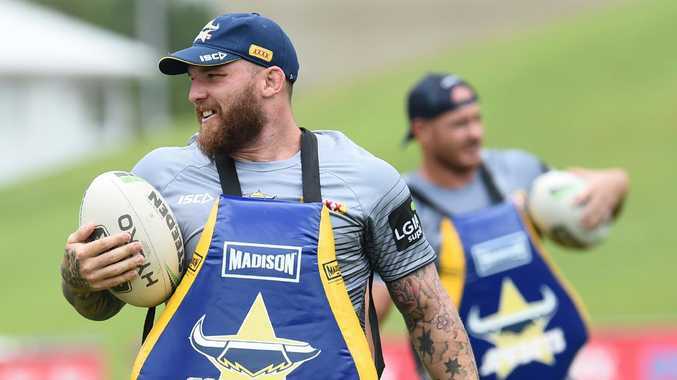 It's an ominous sign from the Cowboys ahead of the hotly-anticipated derby, but Green expected the Broncos forwards to lift even without their main enforcer in Lodge. "Their pack's been spoken in glowing references so far this preseason and there's some really good young players amongst them. 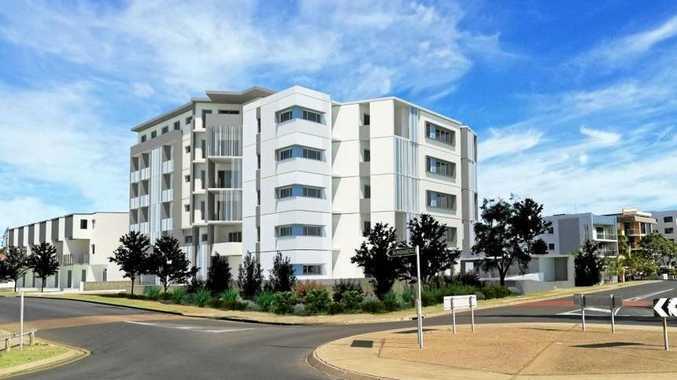 I think it'll be a good clash through there," Green said. 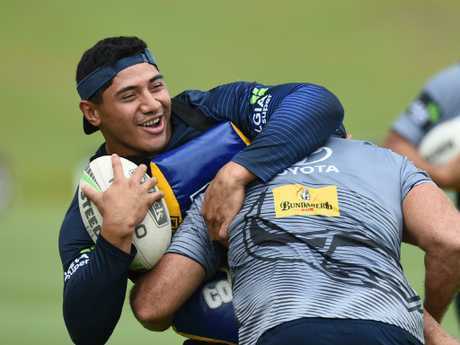 McGuire knows Brisbane's forwards as well as anyone having spent a decade at the club and he was adamant that North Queensland's job won't get any easier with Lodge on the sidelines. "I'm very close with Lodgey and he'll be a big loss for them, but in saying that they've got some class still there," McGuire said. "Joe Ofahengaue is playing good footy, Matt Gillett's back, Tevita Pangai, and they've got a good young forward bench. "They're a very special team. I was there for a long time and I know the capabilities of all the players there. "I don't think they're a team of the future, I think they're the team of now and they're here to compete and they're ready to win football games." Green has named Gavin Cooper to start in the backrow after a late positional switch against the Dragons saw Taumalolo take his place with McGuire promoted to starting lock. Green hinted that he may stick with that same forward rotation as Cooper regains his fitness after a preseason calf issue, but he said the whole team still had some room for improvement. "We put ourselves under a bit of pressure at different times, particularly at the start of that second half just with a few unforced errors," Green said. "I thought early we were probably still just a little bit clunky which is understandable given it was round one, but once we got into a good rhythm of the game we played some good footy." Cowboys team to play Broncos: 1 Jordan Kahu, 2 Nene MacDonald, 3 Justin O'Neill, 4 Tom Opacic, 5 Javid Bowen, 6 Te Maire Martin, 7 Michael Morgan (c), 8 Matt Scott, 9 Jake Granville, 10 Jordan McLean, 11 Gavin Cooper, 12 Coen Hess, 13 Jason Taumalolo, 14 John Asiata, 15 Josh McGuire, 16 Mitch Dunn, 17 Francis Molo. Reserves: 18 Ben Hampton, 19 Jake Clifford, 20 Corey Jensen, 21 Enari Tuala.